Butter is a dairy product which is prepared by mixing fresh or fermented cream or milk, to distinct the butterfat from the buttermilk. Turning plain meals into masterpieces is the speciality of butter. Often it isused as a spread, and also in cooking like sauce making, pan frying, baking and so on. Butter consists of milk proteins, water and butterfat. 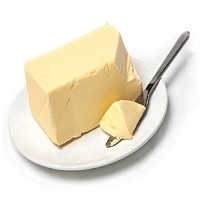 Butter is made from the butterfat of milk while modern margarine is made mostly of refined vegetable oil and water. Butter is adulterated with variablequantities of margarine tempting since butter is much more costly than margarine.